Home gyms are useful for multi-exercise routines in the cool and calm atmosphere in your own home. Avoid distractions from other members and freely make all the grunts, complaints and shouts of praise that you want to, avoid travel time, soiled equipment, hygiene issues and waiting in lines for the workout machine that you desire. Experience the convenience of a home routine that fits your schedule on equipment that matches your needs. There are many different brands that manufacture home gyms. This complete buying guide will list the top 10 home gym machines and will outline pre-purchase considerations and reviews for the best home gyms available on the market. Kick start your journey to health, weight loss and maximum fitness, today, with a home gym. Vinyl weight stacks are the best economical choice for a home gym because they are much less expensive than cast iron or steel stacks. You will want to choose a home gym that includes plenty of weights for the gradual increase of weights as you workout, improve and get stronger. The more that you train, the stronger you will become and the more weight you can lift. Beginners can benefit from a home gym with a maximum weight stack of 70kg. Intermediate and advanced trainers would benefit most from a weight stack above 80kg. Proper alignment and body position are important for properly performing each step in your daily workout, and seat adjustments are a necessary feature that is needed to avoid physical injury. The home gym’s seat height should have an adjustment option for correctly aligning the seat for the proper performance of your home gym, training exercises. Less expensive home gyms often include plastic nylons and bushings that add resistance with friction. Plastic pulleys and cables commonly jump and grind which impedes the desired smoothness of each exercise. If you desire a seamless, smooth glide, while you exercise, choose a machine that uses 2000 pound tensile aircraft cables. This will also ensure that the gym is durable and longer lasting. Less expensive machines lack a quality, structural design and often move and shift during use due to a weak framework. 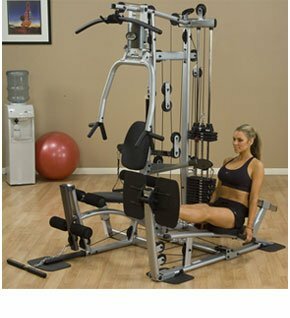 A good way to choose a sturdy home gym is to check the machines maximum weight capacity. The higher weight capacity will indicate a sturdy structural design. 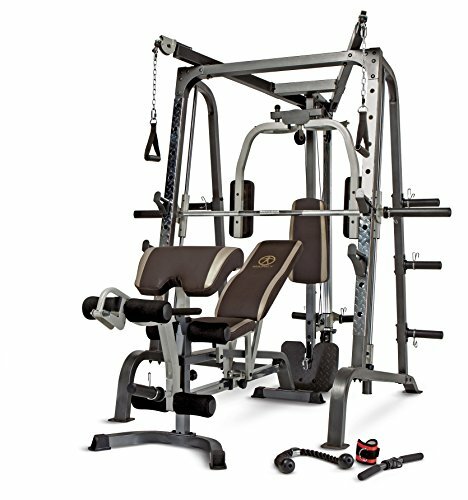 The Marcy Diamond Elite Smith Cage is a versatile, smooth-working machine that features Ultra-Glide linear bearings, a low pulley with an attached footrest,a dual-function, leg muscle sculpting, leg developer and press bar. 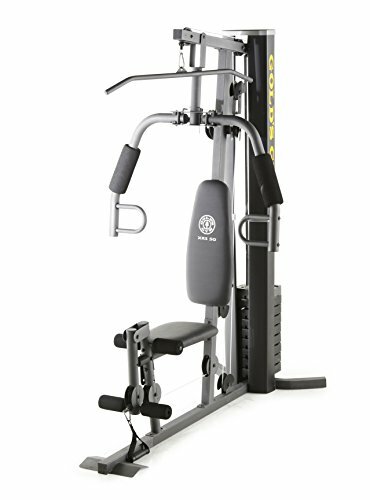 This home gym includes six Olympic weight pegs for storage (the Olympic sized plates must be purchased separately), heavy-duty square steel tubing, two-toned foam vinyl upholstery, contoured roller pads for comfort and an attached, adjustable curl pad. The Marcy Diamond Elite provides strength training exercise for every major muscle and offers more than a hundred types of exercise. The Marcy Diamond Elite is a heavy-duty, professional-grade home gym that offers the smoothest ride. It is suitable for users of all levels. Cons: The Marcy Diamond Elite is priciest out of the selected top ten best home gyms on our list. The high quality and the versatility may save money in the long run. The assembly is difficult due to unclear instructions and there are many pieces to sort through. The Bowflex PR1000 is a powerful home gym that can improve your fitness level, strengthen your muscles and offers some cardio with more than 30 strength exercises and the built-in rowing station. The Bowflex PR1000 home gym provides 210 pounds of Power Road resistance to assist you in properly exercising your arms, abs, core, chest, shoulders, back and lower body. The PR1000 model has a smooth, sliding seat rail, multi-use hand-grips and ankle cuffs and a workout placard for displaying your daily workout. There are also upholstered, four-inch cushioned rollers for working your legs in leg extensions, leg curls, horizontal bench press and triple-function hand grips to complete lat pull downs. The Bowflex PR1000 is great for novice exercising or beginning bodybuilders. The beginning weight setting is just 5 pounds. The weights can be adjusted quickly and easily by hooking or unhooking rods that will increase and decrease the weight settings for exercisers. Note that 210 pounds of resistance do not commonly offer enough weight for serious bodybuilding. 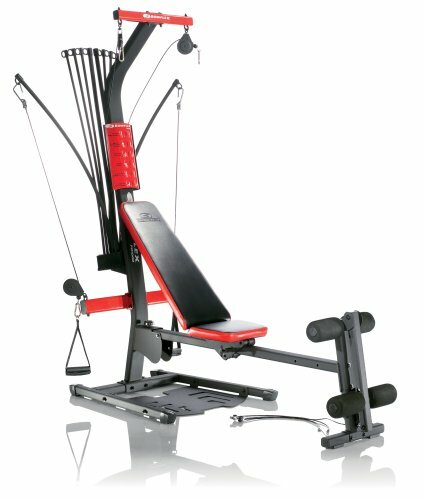 Cons: The Bowflex PR1000 model is not for serious bodybuilders and the max weight can not be increased. It also does not include an instructional DVD. The Powerline BSG10X is a powerhouse of durable strength. More than 40 strength training exercises can be completed with the traditional press bar and the lat pulldown station. The 2,200-pound military-grade aircraft cables provide smooth movements, the 11-gauge mainframe construction is durable, the chrome-plated, adjustable seat post can telescope easily for precise positioning. The system uses impact-resistant, fiberglass-reinforced nylon with steel ball bearings, and it has a 160-pound weight stack. The Powerline BSG10X is easy to assemble in the home setting and uses a small area. It requires just four feet of floor space and sits six feet tall. This model doesn’t require switching cables, adding or removing free weights, and is easy for novice users. Assembly requires placing a floor mat in position before assembly, and this map may prove impossible to add after assembly. There is no option for increasing the maximum weight stack of 160-pounds, so the user may hit a lifting plateau. 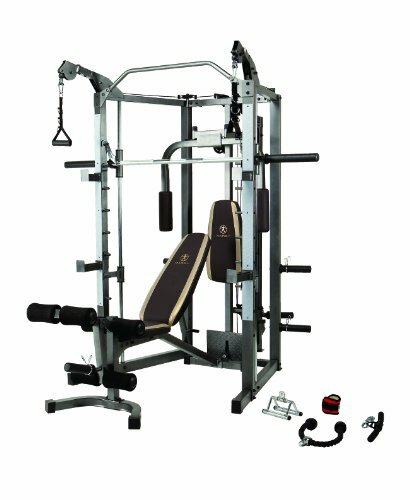 The Marcy Combo Smith Machine is a complete home gym with multiple features for a complete workout. The attached Smith style press bar has adjustable safety stops for a safe and private home workout. The 14-gauge steel tubing construction offers a strong and durable frame that confidently supports the independent upper pulley system, an adjustable seat complete with a comfortable back pad that can be adjusted to lie flat, incline, or decline. Additional features include the total leg developer, chin-up bar, and two convenient storage posts designed to hold Olympic-sized weight plates (The Olympic sized plates must be purchased separately). 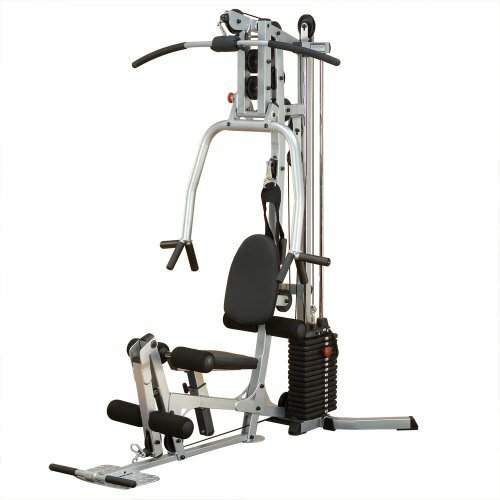 The Marcy Combo Smith Machine is durable and high-quality. The pull-up bar is wobble-free, the guide rods and all of the pulleys and cables run smoothly and freely. Difficult assembly with unclear instructions and too many pieces. Those who are taller than 6’4” may not be compatible with every exercise position. Bowflex Blaze users can perform over 60 strength training exercises that develop every major muscle groups. The lower pulley on the squat station is great for working the hamstrings, glutes and quads. The lat tower has an angled lat bar for building the back and shoulder muscles,a leg extension and leg curl attachment for working and building definition to the legs. The 210 pounds of Power Rod technology resistance is upgradable to 310 or 410 pounds. The Bowflex Blaze is easy to use and to store, and it is versatile. It is a quiet machine that is easy to assemble. Bowflex Blaze model uses the patented Power Rod technology for a safe, smooth and intense workout. The lat bar does not rest securely and tends to fall off when you move the machine. Those who are taller than 6’4” may not be compatible with every exercise position. The Body Solid EXM3000LPS takes up minimal space. There are many exercise options, such as the multi-press station, the leg and calf press, a pec station, lat pulldown, high pulley station, mid pulley station, ab crunch, leg extension and leg curl station. Additional stations include the seated row, low pulley and dual 210-pound alloy steel weight stacks. 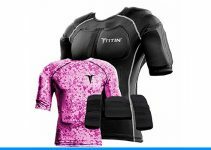 The duraFirm pads and the weight stack shrouds add comfort and convenience. A workout poster and DVD are included. The Body Solid EXM3000LPS is built with solid welds, a strong frame and durable, long-lasting padding. Two users can exercise together simultaneously. This workout equipment has numerous functions, yet doesn’t require a lot of space. The weight stacks are 210 pounds each and the powerful and challenging leg press resistance adapts up to 420 pounds. Cons: The assembly is difficult to complete with unclear instructions and many similar pieces. 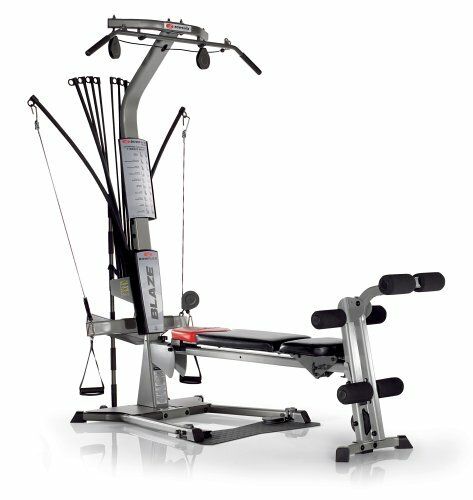 The Bowflex PR3000 offers powerful and versatile strength training without requiring a change of cables. 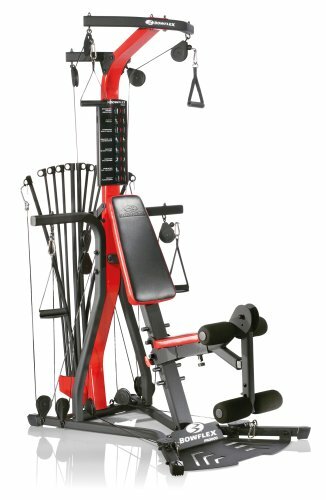 The 210 pounds of Power Rod Resistance can be upgraded to 310 pounds, the innovative pulley system, 4” upholstered and comfortable roller cushions, the vertical bench press, triple-function ankle cuff grips and hand grips and a workout placard bring a total gym in the home. The Bowflex PR3000 assembles easily and folds for storage. The power rods resistance system exercises the muscles better than traditional free weights can. Cons: The Bowflex PR3000 offers a max of 210 pounds of resistance, and this may not be challenging enough for some. The power rod system may be difficult to adjust to for prior free weight lifters. 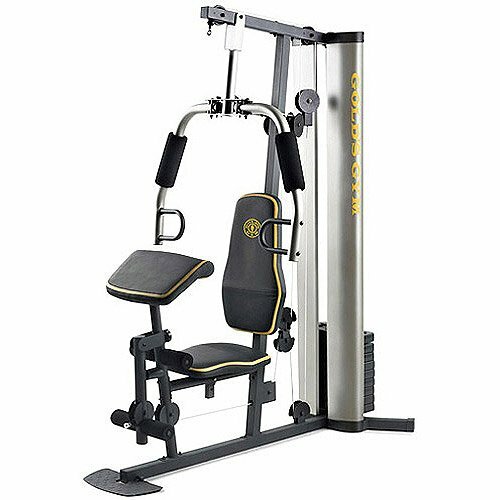 The Gold’s Gym XR 55 offers an all-in-one strength training home gym with features such as a 125-pound weight stack with 330 pounds of resistance. The lat bar, high and low pulley systems, fly stations, chest press, four-roll leg developer, and the included exercise chart that is designed by a certified personal trainer bring a challenging weight lifting, endurance and strength training system into your home. The Gold’s Gym XR 55 is perfect for beginning a strength training routine. Cons: Offers only basic resistance when compared to other home gyms. This model’s frame is not solid and sturdy. The Gold’s Gym XR 55 has limited height flexibility. The Gold’s Gym XRS 50 offers a wide range of strength training, and it features a combination chest press,4-roll leg developer, a lat bar, butterfly arm station, high and low pulleys, 112-pound vinyl weight stack and a workout chart that has been designed by a certified personal trainer. The Gold’s Gym XRS 50 is easy to assemble. This model is best for beginners and covers only the basics in strength training. Cons: The Gold’s Gym XRS 50 offers a limited range of motion for most exercises and is difficult to use for anyone who is taller than average. The Powerline P2LPX is easy to use and offers multiple functions. Features include an ergonomically correct press arm, multi-position hand grips,functional pulleys,a functional training arm and the adjustable and swivelling seat adjusts easily for different exercises. The Powerline P2LPX is sturdy and durable. An instruction manual listing all the exercises that can be performed is not included. Assembly is difficult even with recently updated instructions. Home gyms offer an all-in-one resource for at home fitness, weight loss and maximized health. Home gyms are machines that allow you to strength train every major muscle group using a variety of exercises. Home gyms users are successful because using a home gym is time-efficient, saves money, allows the user more freedom, and is less likely to introduce illness as compared to visiting and working out in a public fitness center. When you choose to purchase a home gym, you should consider home gym options such as weight stack, adjustability, weight stations, resistance pulleys and cables and the quality and durability of the frame. You can use our Best 10 Home Gyms Review to choose the best home gym for your lifestyle, your fitness needs and your home setting.